If you live in the UK but haven’t heard the name of Greece born, London based fashion designer, Mary Katrantzou then you must have been hiding in a cave or have far more too ‘important’ things to do, far too many friends to keep you busy than me, a woman with no ‘important things to do, no friends to keep her busy (though when I was a little, I used to have lots friends, imaginary friends, I even formed an imaginary gang with them. Nowadays, if you want to find my imaginary friends, just look at my Facebook page.). 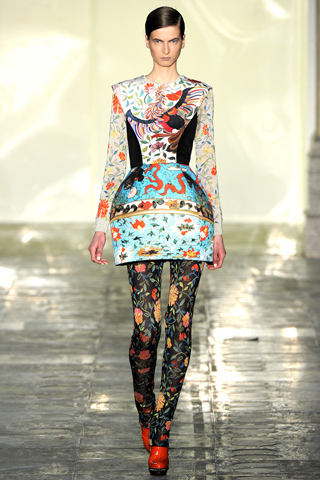 I first saw Mary Katrantzou’s design from my fashion ‘bible’, Vogue. Ahmen! In just three years (six collections), Mary has risen from unknown St Martins graduate to internationally acclaimed darling of the fashion world. Her design is always very bold with explosion of colours and prints, it’s not for the faint-hearted. I’m so in love with her spring 2011 collection. She’s gone no designer has ever gone before, ‘with this collection, I wanted to put the room on the woman, rather than the woman in the room,’ Katrantzou said it herself so she did. She’s a true genius! 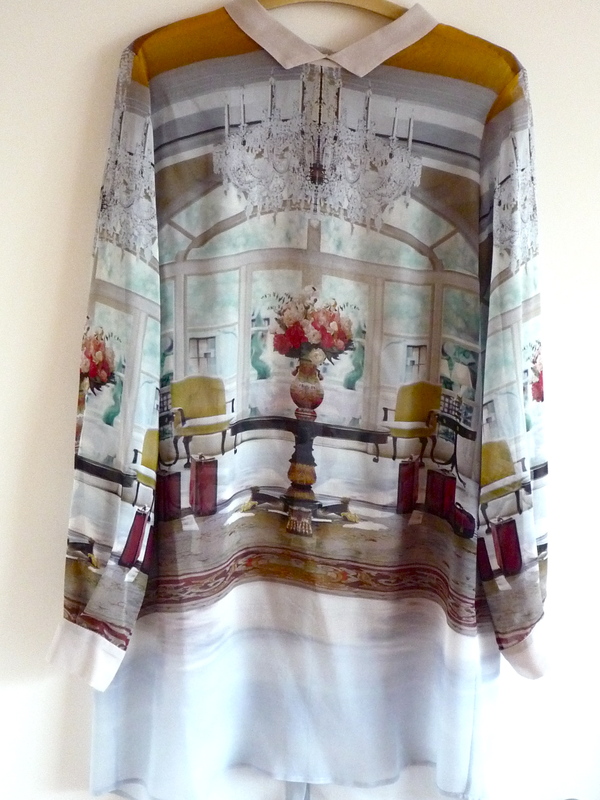 I stumbled across a Mary Katrantzou’s long silk shirt dress with a hotel lobby prints front and back on sale last year, even though it’s one size too big for me, I knew I had to have it. Who cares if you look like you’re in your early pregnancy when you have a room on the front of your chest? It was a glorious day when I bought the dress, even though I had to eat beans on toast for the next month, totally worth it. Even though, Mary Katrantzou’s collection is selling at an average £500 per piece, most of the dresses are well over £1000, they are still selling out like hot cakes everywhere. Now, there is a hope for our common folks who would like to get our hands on a piece of design from Mary but doesn’t have the bank balance to match. 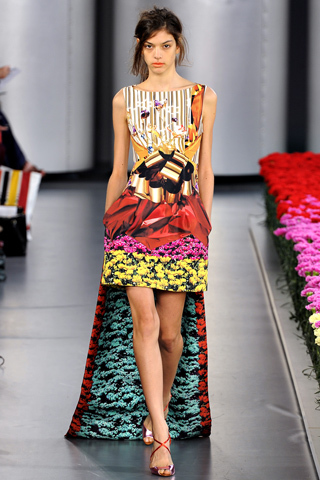 Mary Katrantzou has designed 14 pieces for Topshop, it will be launched as part of Topshop’s 10 year celebration of their support for the NEWGEN scheme in February this year. 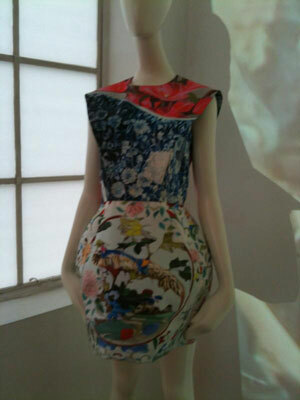 The whole collection is full of statement items, they look like genuine pieces from Mary Katrantzou’s mainline collection. The first picture below, it’s one of the 14 pieces from the collection for Topshop, just look at the clashing prints, the bubbled hemlines, can you see how beautiful the cut is? Can you? Can you? I’m holding my breath for the actual realising date, I hope I’m not going to start to passing out from lack of oxygen.